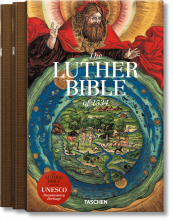 Martin Luther’s Bible, published in 1534, was the first complete German Bible and a pivotal event in the history of Christianity. Luther’s revolutionary translation, modern in vernacular and interpretation, made the Bible accessible to laypeople, fueled anger and revulsion toward Rome and the Papacy, and begat a new religion: Protestantism. The most desirable copies came with shockingly graphic and politically-charged illustrations, such as those depicting the Whore of Babylon riding a seven-headed beast while wearing the Papal crown, or the Four Horsemen of the Apocalypse led by a Turkish soldier. 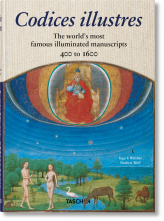 TASCHEN is publishing the 117 hand-colored woodcut illustrations, created in the workshop of Lucas Cranach. Each is meticulously reproduced from a rare and sumptuous original copy, belonging to the Herzogin Anna Amalia Bibliothek in Weimar. Stephan Füssel provides a scholarly overview of Luther’s life, the historic context and cultural significance of his Bible, and detailed descriptions of the illustrations and their iconography. 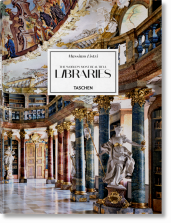 "TASCHEN is publishing the 117 hand-colored woodcut illustrations created in the workshop of Lucas Cranach. Each is meticulously reproduced from a rare and sumptuous original copy, belonging to the Herzogin Anna Amalia Bibliothek in Weimar. 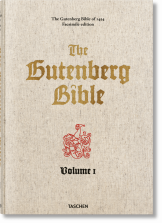 Stephan Füssel provides a scholarly overview of Luther's life, the historic context and cultural significance of his Bible, and detailed descriptions of the illustrations and their iconography."